The Institutional Framework of the 2012 Elections in Ghana: Consolidating or Reversing Democratic Achievement? ABSTRACT: The 2012 elections were peaceful, but the results were contested by the New Patriotic Party in a petition brought to the Supreme Court challenging the National Democratic Congress and the Electoral Commission of Ghana. Revelations during the hearing of the petition raised some disquiet about the abilities of the ECG and the integrity of Ghana's electoral institutions. The fallout from the 2012 elections demands a critical intellectual engagement with the institutional foundation of the elections. There were several institutional changes in the Ghanaian system in the build-up to the elections as well as changes in the general political economy of the country that have made access to public office particularly attractive. This article reviews the institutional context of the elections and examines the constitutional and non-constitutional rules relating to electoral governance, focusing on such issues as electoral management, delimitation of constituencies and assembly size, electoral formula, voting procedure and ballot structure and the party system. It demonstrates how these institutions were implicated in the challenges relating to the electoral process during the 2012 elections, providing insights into how to overcome them. ABSTRACT: Ghana's Fourth Republic has a reputation for having a reasonably high degree of institutionalisation in election administration. Its electoral and democratic success stories have largely been associated with the autonomy enhancing institutional design and leadership of the Electoral Commission of Ghana (ECG), which engender a degree of public confidence and trust. The 2012 elections, however, produced an ominous twist in the hitherto sacrosanct nature of democratic legitimacy in Ghana. This article assesses the role of the ECG, drawing on the quality of the elections, measured by the level of participation, competitiveness and legitimacy, as well as the actions and inactions of the ECG at critical stages in the electoral cycle. Overall, the ECG could be adjudged to have done well, especially on the first two indicators, given the high level of voter turnout (80.15%) and the closeness of the total votes and seats won by the ruling National Democratic Congress and the main opposition, the New Patriotic Party. However, the legitimacy of the election was fiercely challenged with the opposition's rejection of the results and attendant litigation in the Supreme Court. The problem may have been accentuated by the new political economy of oil and the strong desire to access and control oil windfall, the messy application of biometric voter verification as a result of the malfunctioning of the equipment and the controversy over the delimitation of 45 new constituencies in a manner interpreted by opposition parties as gerrymandering. It seems these are not heady days for Ghana's democracy. Rising levels of adversarial elite behaviour not only pose serious democratic threats they raise questions about the depth of the much touted institutional foundations of the country's democracy. ABSTRACT: Since Ghana made the transition to multiparty democracy in the early 1990s there has been a progressive improvement in electoral management and the acceptance by the political players of election results. Six successive elections have been held so far, with two crucial power alternations between two hostile political parties in 2001 and 2009. The 2012 elections presented an opportunity for the country to continue along the path of democratic consolidation. However, the outcome of the elections was vigorously disputed and contested in court by the main opposition party, nearly bringing the country to the brink of violence. This article makes a contribution to ongoing debates about why some elections pass peacefully and results are accepted, while others do not. Various studies have focused on the role of formal institutions in ensuring credible and fair elections. This article, however, emphasises the importance of informal institutions in explaining variations in electoral outcomes and legitimacy in Ghana. Franklin Obeng-Odoom is the Chancellor's Postdoctoral Research Fellow, School of the Built Environment, University of Technology, Sydney, Australia. ABSTRACT: The nature of ideology in Ghana's 2012 elections has not been studied, but to do so is key to understanding social, economic and political developments in the country. This article tries to fill the gap. Theoretical guidance is taken from Giovanni Arrighi's The Long Twentieth Century (1994). While the analysis is cast in the longue durée, the empirical evidence is mostly extracted from the 2012 elections. Contrary to earlier findings that ideology plays no part in Ghanaian politics, it is argued that it was central, to the campaign at least, but that the position is one of common economic liberalism rather than multiple ideologies. So, while rhetorically the parties asserted their differences, substantially and substantively, aspiration rather than ascription was the common unifying logic of the two major political parties. This assessment has some positive but mostly very disturbing implications for the distribution of wealth. ABSTRACT: In the run-up to Ghana's 2012 general elections 'gutter politics', the kind of politicking that focuses on mudslinging, vituperation, personal attacks and character assassination, which usually characterises the nation's election campaigns, gave way to issue-based politics. The contents of the manifestos of the two main political parties, the National Democratic Congress and the New Patriotic Party, were brought into sharp focus. Indeed, through the activities of civil society organisations such as the Institute of Economic Affairs and state bodies like the National Commission for Civic Education, politicians campaigned vigorously by articulating the key policy prescriptions encapsulated in their manifestos. The contents of the manifestos of the two main political parties were virtually the same apart from their policies on senior high school education. Given that the youth constitute the majority of the nation's voting population they were the main target of the various campaign messages, particularly those concerning education, with a view to capturing their support. Through interviews with some 200 respondents aged between 18 and 35 and drawn from a cross section of young people, this study investigates the relevance of party manifesto contents in shaping the voter behaviour of young Ghanaians. Oil and Ghana's 2012 Presidential Elections: Reinvigorating the 'Resource Curse'? Charles Nyuykonge is an independent consultant, political analyst and peace and security practitioner specialising in teaching, training, research, policy analysis and programme design. While completing his PhD (International Relations) at the University of the Witwatersrand he is a Human Rights Observer for the African Union Support Mission for Mali and the Sahel with research interests in African Affairs, Governance, Geopolitics; Human Rights and Peace and Security. Keitumetse Letsoalo is completing her master's degree in Political Studies at the University of the Witwatersrand. ABSTRACT: The threat posed to burgeoning democratic dispensations by natural resources could not be more glaring than it is in Ghana following the discovery of large quantities of oil in what has been named the Jubilee Field. While it is evident that oil revenues could bring about economic transformation and benefits for the citizens of Ghana, prudent economic management of the resources is required. At the same time, the oil boom may prove to be a challenge to Ghana's democratic development if it brings, as it has elsewhere in Africa, an increase in corruption, authoritarianism and conflict. The Jubilee Field raised the stakes in the 2012 presidential election. In their manifestos the National Democratic Congress and the New Patriotic Party, the two leading political parties in Ghana, each made a different proposal about what should be done with the oil revenue. Against this backdrop we posit that the relevance of the 'resource curse' dictum cannot be dismissed. For political parties the stakes remain high. The heightened attention paid to oil adds currency to the conception that resources have a long-standing destabilising effect on African democracies. This article argues that unless visible and apolitical accountable structures are created to manage the oil, multinational lobbyists could fuel post-election political tensions in subsequent elections by funding the pursuit of power of the parties, thus accelerating an end to Ghana's long-celebrated democratic stability. Mustapha Abdallah is a research associate in the Faculty of Academic Affairs and Research of the Kofi Annan International Peacekeeping Training Centre, Ghana. ABSTRACT: This article examines the role of the National Election Security Task Force (NESTF) in the 2012 elections in Ghana. 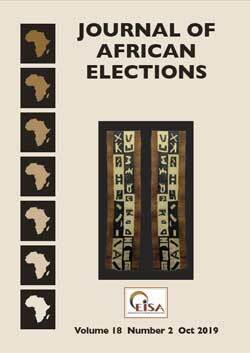 It traces the history of electoral politics in Ghana's Fourth Republic, highlighting significant developments and security challenges from 1992, with a particular focus on the 2012 elections. The structure, composition and powers as well as the functions of the NESTF are discussed. The article further examines the performance of the NESTF during all three phases of the elections relative to security challenges, responses and emerging issues that require urgent policy reforms. Based on face-to-face interviews and participant observations, the article concludes that the 2012 elections were not only keenly contested but all three phases were marred by extreme violence, particularly because of the novelty of the biometric voter registration and verification system. While commending various election stakeholders such as the Electoral Commission of Ghana, we argue that although the election results were contested in court, the NESTF, in particular, played an exemplary role in averting possible conflict after the declaration of the results. We recommend, however, that in subsequent elections the security forces should be seen to be neutral and government should also ensure adequate provision of logistics, transport and communication devices to ensure free, fair and violence-free elections.